We grow marigolds along the perimeter of our garden beds. This is an old gardening tradition that dates back to Adam, pretty sure. Marigolds, as you know, are quite oderiferous, and not in a good way. They’re supposed to keep certain undesirable critters at bay. Honestly, I think the critters have become wise to our ways. They must wear face masks or something because the marigolds don’t seem to stop ’em one little bit. Still, I love the old-time look of the flowers. So every year we dutifully plant them just the same. 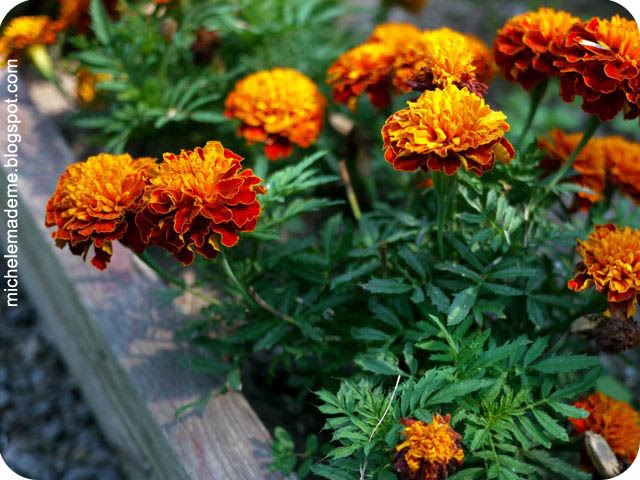 Marigolds are extremely efficient seed producers. There’s really no sense buying the seed. 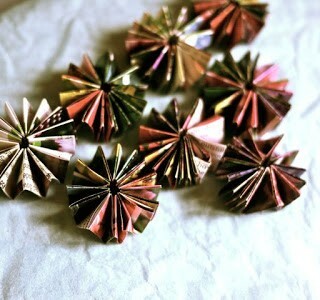 The flowers bloom and then die, and in no time new seeds are ready to be collected and sown all over again. 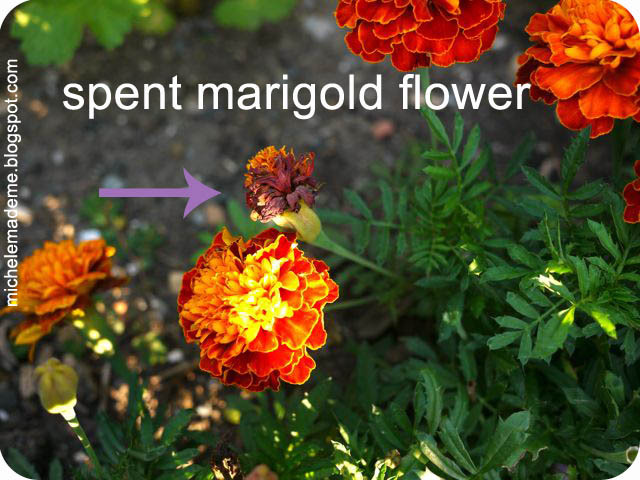 First he finds those old marigold blooms. 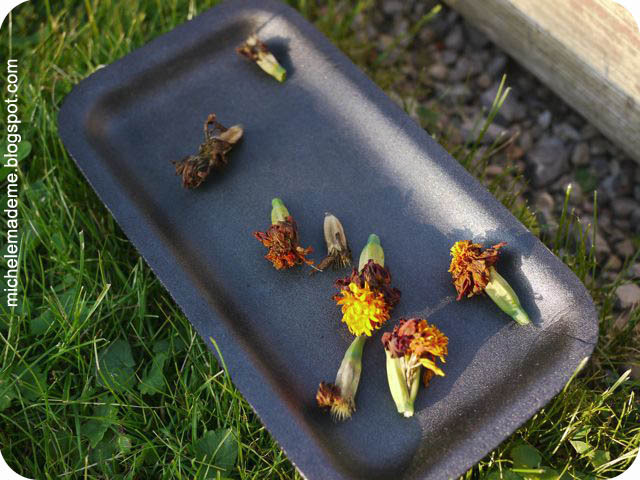 I’m particularly lazy when it comes to dead-heading so I generally leave the spent flowers on the plants until they’re really dead. 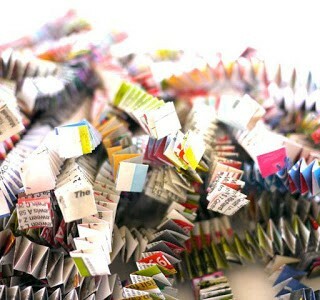 Which makes them easy to find and collect. There’s one now! 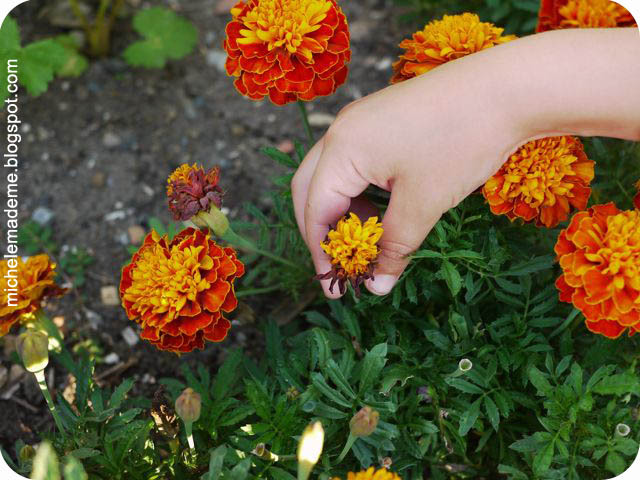 To remove the old bloom, he puts one finger on either side of the flower base and snaps the ol’ girl off with a flick of the wrist. She snaps off real easy-like. He can harvest as many as he likes. I do not mind. 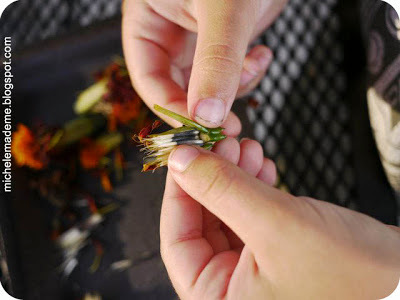 To get at the seed, he starts by removing the spent petals at the top of the flower. Once he’s removed the petals, he can split open the seed pod to expose the seeds hidden inside. Sweet, eh? The seeds are long, narrow, and black and white in colour. If you look closely, you’ll notice the white part is hairy too. For those very old and dry blooms, it’s just a matter of picking out the seeds from the pod. They slide out amazingly well. Below you see the empty pod from an old bloom. 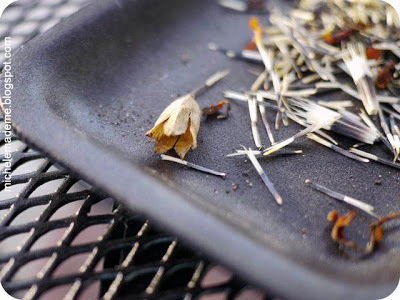 So what he’s left with is this: seeds, empty pods and spent petals. Keep the seeds. Dry them on an open platter in a dry place for a few days and then store them in a clean container or envelope until next season. 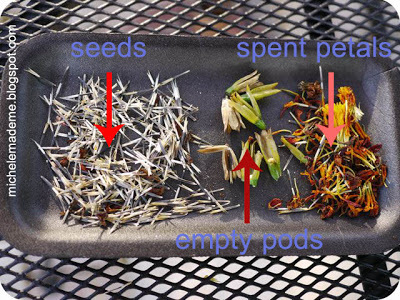 Compost the pods and petals. 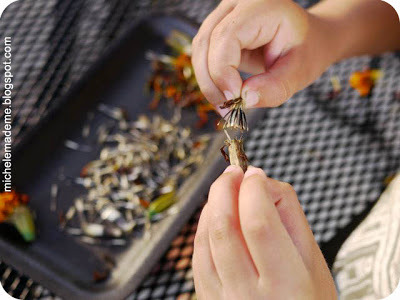 He’s made it a habit of picking apart the flowers as they die and immediately sowing the seeds. 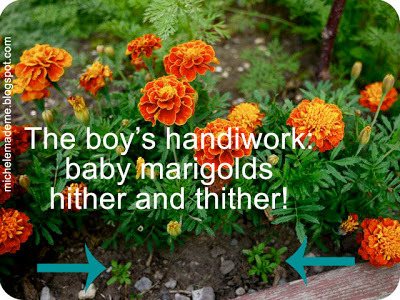 He just throws them on top of the soil along the garden edges. We have new babies showing up constantly throughout the season. Aren’t they cuties with their merry little faces popping up everywhere? Oh that boy, he has two little green thumbs and 8 green fingers. Well, that’s all for now. You have yourself a fun-filled weekend, and I will be sure to see you soon! Lovely gardening work! 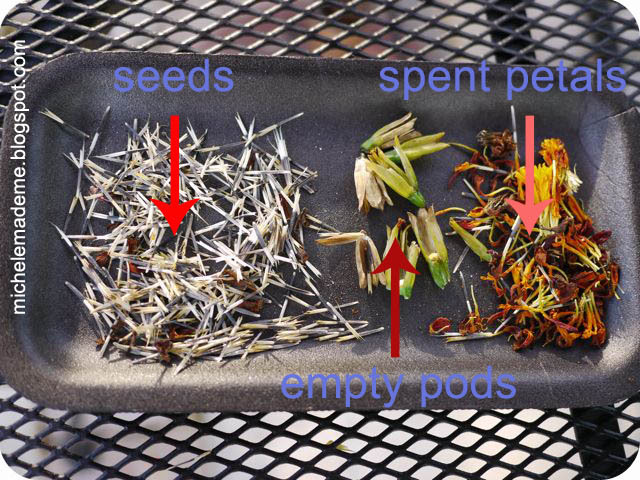 Didn't know you collect the seeds that way (I have never had marigolds planted) and I will store the information in my head for future! Thanks for sharing Michele! I'm off to get some seeds! 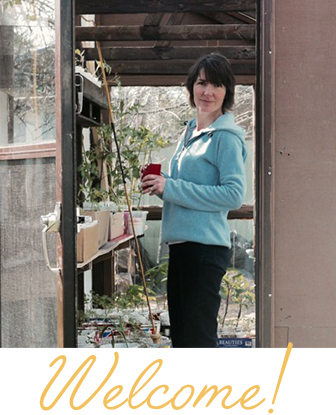 My grandma grew larkspur, and they were just as much fun to seed harvest! 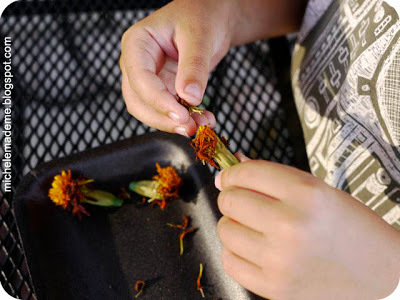 I love that the boy harvests the marigold seeds. Beautiful post. 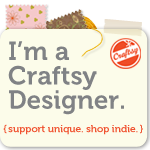 Beautiful little tutorial of a practical skill. We harvest seeds too. I love how it makes me feel part of a natural cycle that is generations older than I am. Another great memory and family tradition you have sown! I never knew that's how you harvest marigold seed! Looks like you have grown a new gardener as well as the marigolds. Thanks for the tutorial. 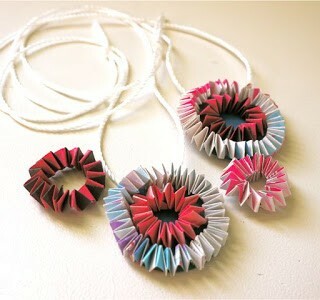 This is so lovely, I will check my bowl filled with old flowers to see if there are seeds to be dried and saved.